Black tick marks at the perimeter of this solar image are 1000 kilometers (622 miles) apart. Each granule, or cell, on the sun's surface is about the size of Texas. This image near the eastern limb of the sun was first taken on July 24, 2002, by Prof. Goran Scharmer and processed by Dr. Mats G. Lofdahl, Institute for Solar Physics, Royal Swedish Academy of Sciences. 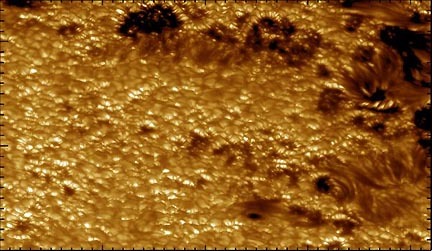 July 16, 2003 Palo Alto, California - At the recent American Astronomical Society's Solar Physics Division meeting in Laurel, Maryland, solar physicists from Lockheed Martin Solar and Astrophysics Lab (LMSAL) at the company's Advanced Technology Center in Palo Alto, California, along with other European scientists, presented the highest resolution images ever taken near the visible edge of the sun.